Our bodies are largely composed of minerals and therefore the mineral balance in our bodies is of extreme importance. The easiest way of obtaining most vital minerals is by eating high quality salt. This can be either mountain salt (often called Himalayan rose salt or the like) or sea salt (this is gray in colour and crude, and has not been 'cleaned' with harmful synthetic substances). In contrast, 'normal' table salt is bad for us and should by all costs be avoided as it is highly processed, and sodium is often added in excess, making our bodies very confused. Minerals keep our bodies free from impurities, and as such pure salt is not harmful to us, we can gladly eat plenty. Many of the vitamins and nutrients vital for our well-being are found in fresh and living food. The smallest and most sensitive nutrients are destroyed by heat, and food containing them should thus be eaten raw. Such foods are berries, all the greens that are fresh from nature, local vegetables, and sour fruits. In the northern hemisphere raw food often feels too cold and insufficient, but even so it is important that some uncooked food is added to each meal. This can be a salad composed of different greens. Fats do not make us fat, that is a myth and a lie. This concerns cold-pressed, organic, natural and aboriginal fats, not the processed transfats that are continuously sold to us as healthy, although they actually are deadly. We need both 'hard' and 'soft' fats, which balance each other. Hard fats are for example butter and coconut oil (which is antibacterial and an excellent purifier), while soft fats include cold-pressed vegetable oils. Soft fats are especially important for women's hormones and they should be eaten by women in daily abundance. The balance between Omega 3, 6, and 9 is important, which highlights the importance of eating different kinds of oils and fats. These might for example include fish or fish oils, flax seed oil, avocado oil, hemp seed oil, coconut oil, and olive oil. Brassica oils (includes rapeseed oil and are very common in Finland as cooking oils = rypsi) are not recommended as the plant is of a highly refined species and as such not very aboriginal. This can be replaced with sunflower seed oil. 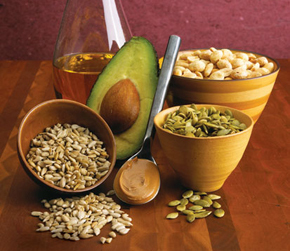 Good fats can be eaten with a good conscience because we need much more of them than the current western diet suggests. Green is the colour of pure, and as such all deep greens purify our bodies. Perhaps the most efficient food for this purpose are green powders, which can be anything from wheat grass to spirulina. Also, fresh greens are very good and recommended, for example nettle and other leaves. These should be chewed well to increase their force (all food should be chewed well and eaten slowly to lessen the burden on our stomachs). However, all purifying plants are extremely effective, and should be eaten in small amounts, especially in the beginning. Otherwise a risk of intoxication becomes relevant. Superfoods contain ancient wisdom and act as acute aids to quickly provide us with missing nutrients and purify our intoxicated bodies. But in a natural state, when we are pure and gain all our necessary nutrition from pure, natural, organic, high quality foods (which is currently hardly the case) superfoods are generally not needed. - The best food for each person is usually the food that grows closest to our place of birth. This highlights the value of local food, which should definitely be taken into consideration when shopping for food. - Herbs have subtle effects which we often do not notice because our bodies have been numbed by bad food and alcohol. But even if they go unnoticed, the effects do take place in our bodies. - If you are tired, do not look for stimulants, what you need is sleep. When you wake up you can begin changing your diet to a more energy efficient kind. - Concerning carbohydrates: again, high quality is what matters. Wild rice, quinoa, amaranth, etc are good sources. - The most important nutrient addition to eat is vitamin D, especially in a country like this where we don't see the sun during half the year. This vitamin cannot be taken in excess and can freely be eaten in abundance. - Fanaticism and absolutism is usually not good, they only increase stress, which is the worst state in which to eat. - New things should be introduced slowly and moderation is the key. - By far the best way to know what to eat is learning to listen to yourself. You know what you need, and you feel what is right. If you have any questions or would like a personal consultation with Samuli, do contact me. I'll be back soon with more superinformation.